Hunting enthusiasts have somehow convinced the Swiss government to legally support hunting stray cats as a form of population control. Stand up to this bizarre and dangerous legislation! 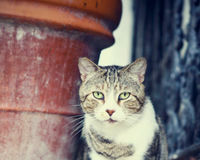 Lawmakers recently decided to reject a proposed ban on hunting stray cats in Switzerland. They bought the argument that cats may be dangerous to birds and lizards and humane sterilization methods were impractical. This is ludicrous. Shooting stray animals is a dangerous, cruel and ineffective method of population control. Shooting stray cats poses many issues. It is true that cats hunt wild birds and lizards, but they also help control rat populations. It's not always immediately apparent whether a cat is a stray or has a home, and beloved pets will no doubt be accidentally killed. Most hunters aren't able to kill the animals immediately; stray cats are often wounded and suffer a slow, agonizing death from bullet wounds. Even if someone can ignore the suffering of animals, they can't ignore the danger this policy poses to humans. In some places, it is permitted to hunt cats up to 200 meters away from homes. The only way lawmakers will take action is if they understand that there is worldwide opposition to their plans. Tell Swiss lawmakers to end this hazardous, futile practice immediately!